In June 2014 the United Nations High Commissioner for Refugees (UNHCR) reported that the worldwide population of displaced people – meaning refugees, asylum seekers, and internally displaced persons (IDPs) – topped 50 million people for the first time since the Second World War. This overall rise is not, unfortunately, the only cause for concern. 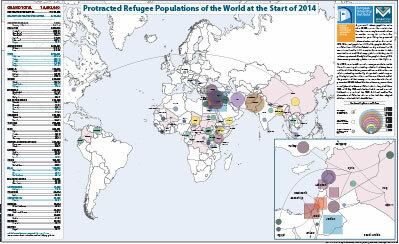 Changes in the composition and characteristics of the world’s displaced population are worrying as well. by Cameron Thibos and Sara Bonfanti. 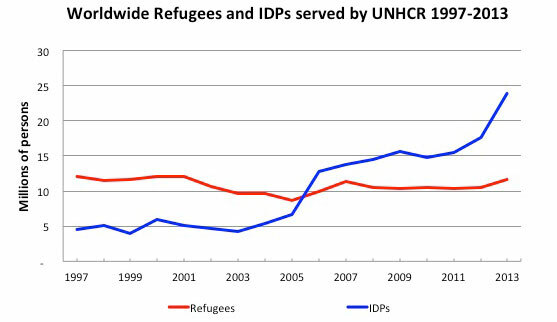 Refugee populations, while they have risen slightly, have remained more or less stable since at least the mid-1990s. They have protracted though, with around half of the world’s 11.7 million non-Palestine refugees – some 6.3 million people – neither returning to their countries of origin nor receiving asylum in their countries of residence within five years of their displacement. When Palestine refugees are included in this total, we can say that two-thirds of the world’s global refugees live in protracted refugee situations today. While the stability of global refugee populations might first seem like a cause for celebration – at least the situation is not further deteriorating, even if it is protracting – IDP populations have grown dramatically. At the start of 2014 some 33.3 million persons were internally displaced, according to the Norwegian Refugee Council’s Internal Displacement Monitoring Centre (IDMC), up from 25 million people a decade earlier. The scale of forced displacement in the world is indeed worsening. The difference is that, in recent times, more and more vulnerable people are not escaping across international borders. They instead remain trapped, or choose to remain, in their countries of origin. The Migration Policy Centre has produced two large-scale wall maps to illustrate the state of protracted refugee and IDP populations served by UNHCR today. UNHCR is tasked to monitor and provide relief for all non-Palestine refugees, while the much smaller UNRWA holds the institutional mandate over Palestine refugees. UNHCR has increasingly extended coverage to IDPs as of late, however as this still falls outside of their official mandate they do not cover all IDPs in the world. Maps measure 106cm x 170cm and are suitable for full-colour printing on a plotter. Thirty-nine protracted refugee situations existed at the start of 2014, according to UNHCR and UNRWA statistics. A protracted refugee situation exists when 25,000 or more refugees originating from the same country have sought refuge in another country for at least five consecutive years. With a total population of 11.3 million people, they originate from 18 countries and reside in 28 countries. The biggest single group is Palestine refugees, totaling slightly more than 5 million people. Afghanistan has the second biggest protracted refugee situation in the world with half that number, or 2.5 million people. The combined total of all non-Palestine refugees is 6.3 million. 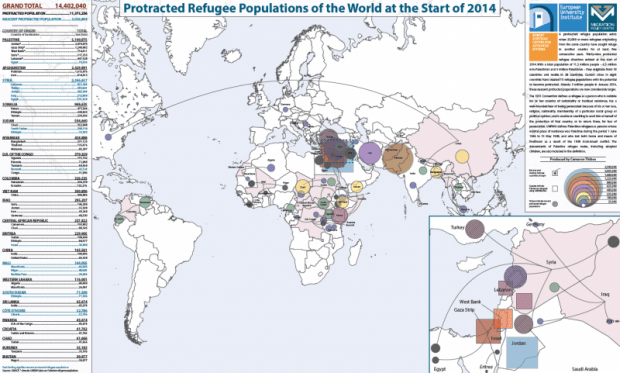 Current crises in eight countries have created 15 refugee populations with a high potential to become protracted. Already 3 million people in January 2014, these nascent protracted populations are now considerably larger. The biggest producer of refugees today by far is the Syrian civil war. 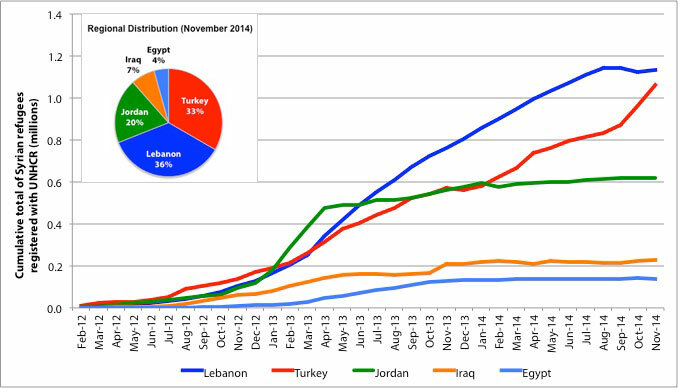 Starting in March 2011, the fighting there had sent 2.4 million people into neighbouring countries by January 2014 and 3.2 million by November 2014. With no end to the conflict in sight, it is only a matter of time before these individuals enter the lists of protracted refugees as well. Who is included in the statistics? The 1951 Convention defines a refugee as a person who is outside his or her country of nationality or habitual residence; has a well-founded fear of being persecuted because of his or her race, religion, nationality, membership of a particular social group or political opinion; and is unable or unwilling to avail him or herself of the protection of that country, or to return there, for fear of persecution. 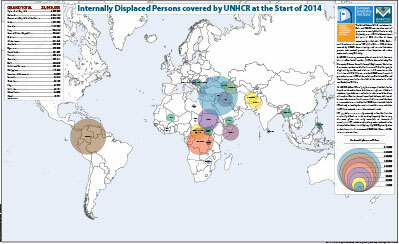 Since 2007 the refugee population category also includes people in a refugee-like situations, most of whom were previously included in the Others of concern group. This sub-category includes groups of persons who are outside their country or territory of origin and who face protection risks similar to those of refugees, but for whom refugee status has, for practical or other reasons, not been ascertained. The UNHCR mandate covers all refugees, except some 5 million Palestine refugees residing in areas of operation of the United Nations Relief and Works Agency for Palestine Refugees in the Near East (UNRWA). However, the Palestine refugees living outside the UNRWA areas of operation fall under the responsibility of UNHCR and are thus included in its Statistical Online Population Database. UNRWA defines Palestine refugees as persons whose normal place of residence was Palestine during the period 1 June 1946 to 15 May 1948, and who lost both home and means of livelihood as a result of the 1948 Arab-Israeli conflict. The descendants of Palestine refugee males, including adopted children, are also included in the definition. UNHCR was extending nominal protection to nearly 24 million internally displaced persons (IDPs) in 24 countries at the start of 2014. Just five of these countries—Syria, Colombia, D.R.C., Sudan, and Somalia—are home to 17.9 million IDPs, or 75% of those covered by UNHCR. Access, security, and resource limitations prevent such nominal protection from becoming substantive assistance for many IDPs today. As UNHCR does not operate everywhere, its statistics furthermore do not reflect the full number of IDPs in the world today. IDMC estimates that, worldwide, there were 33.3 million people displaced by conflict and violence in 57 countries at the beginning of 2014. This suggests that UNHCR extends nominal protection to around 75% of the world's conflict-derived IDPs, and that it was present in less than half of the countries in which conflict-derived IDPs live. The United Nations defines IDPs as "people or groups of individuals who have been forced to leave their homes or places of habitual residence, in particular as a result of, or in order to avoid the effects of armed conflict, situations of generalised violence, violations of human rights or natural- or human-made disasters, and who have not crossed an international border." Since 2007, UNHCR statistics have included both IDPs directly assisted by the organisation and those assumed to be in IDP-like situations but, for whatever reason, cannot be registered as such. Data aggregators like the IDMC and the UNHCR rely in large part on self-reporting from national governments and NGOs to determine IDP levels in any given country. This introduces myriad problems into the data, not only because IDPs are often in areas of violence or limited access, but also because governments and organisations have may have political reasons for under- or over-reporting data. 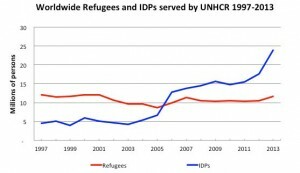 Thus while IDMC and UNHCR data are among the best available, it must always be treated with some caution. A lack of accurate and disaggregated data on IDP populations is a problem shared by a number of countries, particularly those where displacement is a sensitive or contentious issue or where IDPs have settled in dangerous places, not easily accessible to international organizations. As a result, figures often reflect only the people a government has registered as IDPs, or those living in camps. They rarely account for returns, repeated displacement, unregistered IDPs or those who have left camps but have not achieved a durable solution. NGOs and civil society organizations that assist IDPs also provide data about their beneficiaries, however they tend to lack the capacity to report on every displacement situation in a country. Protracted displacement situations, whether they are internal or involve a border crossing, present challenges that are often less visible but no less difficult to overcome than the immediate needs of new refugees. Demanding endeavours such as granting displaced people access to education and other fundamental social services, or supporting their search for stable sources of income attract less attention and funding. They require interventions over long periods of time, as well as sustained leadership and commitment from a broad range of organisations and institutions. Crucially they demand a change in the perception of displacement from being a solely humanitarian problem to a matter for development agencies, private companies and others to address. Such a change, in turn, involves a shift in the way displaced people are approached, namely from helpless and passive victims to agents autonomously developing their livelihood strategies and seeking their own solutions to their protracted displacement. UNHCR and other humanitarian agencies have gradually embraced these changes and now recognize the necessity for a development-led paradigm that benefits both displaced populations and their host communities. By contrast, host governments tend to overlook the potential contributions of refugees and IDPs, whose presence is therefore still largely opposed. Indeed host governments tend to perceive displaced people as only as ‘burden’ that imposes a range of security, economic and environmental problems on host countries. Although incorporating large numbers of refugees is never unproblematic, it must be recognized that they bring with them significant resources in the form of international humanitarian assistance, economic assets, and human capital. These resources represent an important potential contribution to the host state. Appropriate humanitarian programmes as well as legal reforms to facilitate the participation of displaced persons in host economies are therefore of crucial importance, not only to facilitate displaced persons in their pursuit of productive lives but also for host states to capitalize on refugees’ resources for the well-being of the own nationals.